You can attach files from your computer, OneDrive, or other storage account to email messages and calendar events and share them with others. You can also embed pictures in your email messages and calendar events. At the bottom of a message or calendar event, select > Computer. At the bottom of a message or calendar event, select > Cloud locations. You can also share files from other storage accounts. Anyone you share the file with can see the latest changes. See Use a storage account with Outlook.com for more information. In a message or calendar event, select > Cloud locations. 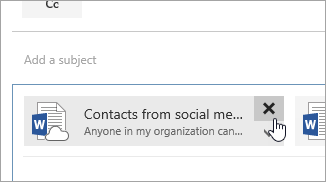 You can attach a message to another message in Outlook.com. You can't attach a copy of a folder in Outlook.com. 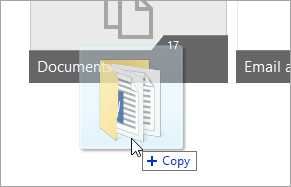 However, you can share a folder in OneDrive. Go to OneDrive.com, and sign in using the same email address and password you use for your Outlook.com account. 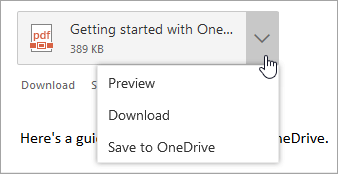 Drag the folder into OneDrive.com. Go to Outlook.com and create a new message or open a message from the message list. Select > Cloud locations, choose the folder in OneDrive you want to attach, and select Next. Select > Change permissions > Anyone can view. Don't open an attachment sent in an email message unless you trust the content and the person who sent it to you. Attachments are a common method for spreading computer viruses. 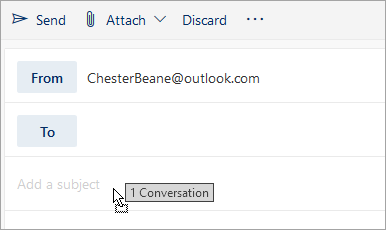 In the email message, select Preview from the drop-down menu next to the attachment to view the contents of the attachment without opening it. Long file names of attachments might be shortened in Outlook.com. This won’t affect the contents of the file. You can only attach files to calendar events that you or a delegate created. The first time you attach a file from a cloud location, you'll be asked if you want to do the same for all future files attached from the cloud. You can change the attachment settings whenever you want by going to Settings > View all Outlook settings > Mail > Attachments. You might receive an error that says "We couldn't open the image file" or "access denied" when you try to open a picture or other attachment. This error could occur if you have a non-Microsoft email address as the primary email address on your account. To resolve this issue, be sure to set your Microsoft email address as the primary email address. Go to Manage how you sign in to Microsoft. Next to the alias you want to make your primary alias, select Make primary. The alias has to be a Microsoft email address, such as one that ends with @outlook.com, @hotmail.com, or @live.com. To learn more about managing your aliases, go to Manage aliases on your Microsoft account.